The Boston Red Sox may be tied for first in the American League East (for now. In ten minutes, they won’t be). They may have scored the fifth most runs in baseball. They may have the best bullpen in baseball. But the Boston Red Sox have a lot of problems. Youkilis is at .254. Ellsbury .234. Papi .218. Varitek .216. Jason Bay is hitting .184. Nick Green is at .150. J.D. Drew is at .137. That’s 8 of the 9 offensive players with the other position being platooned between Rocco Baldelli and Mark Kotsay, who are hitting .214 and .211 respectively. Without Pedroia, the team is hitting .207 in July. Want to go back to June? 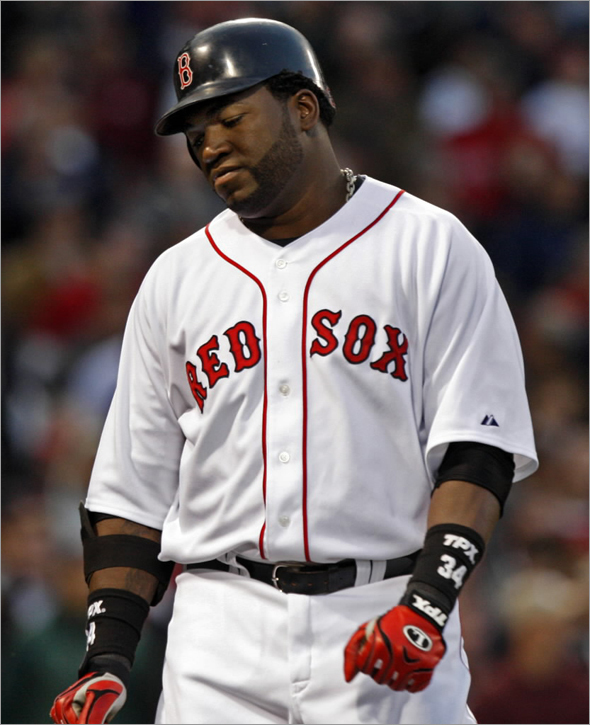 The team was certainly better as Ortiz hit .320, Ellsbury .313, and Drew .292. But the rest of the lineup struggled mightily. Youkilis hit .244. Green .233. Varitek .230. Pedroia .222 and Lowell .206. Since the All Star game, the Sox have scored 12 runs in 5 games. It’s not like they have played the top pitchers in baseball every night either. Ricky Romero, Marc Rzepczynski, Roy Halladay, Kevin Milwood, and Tommy Hunter. Except for Halladay, the Sox should have averaged 4-5 runs a game against everyone else. Starting pitchers are entering the game knowing they can’t throw a bad pitch, because the offense isn’t going to pick them up. Worst off all, the team is just getting worse. Drew’s season average has dropped below .240 while no one on the team is hitting over .305. Baseball generally has trends. Players get hot and cold and things even out over the season, but the Red Sox have gone TWO months of consistent offensive failures. Things are getting worse and worse and worse and worse. Even as the bullpen shuts teams down (go look at Daniel Bard’s stats) and the starters continue to keep the team in it, the offense is nowhere to be found. If I were Terry Francona, I’d put everyone’s name on a dart board and decide the batting order by throwing darts. It can’t be any worse than what has been out there recently. The trading deadline looms in 10 days and the Sox desperately need to find a bat. Anyone think that Drew and Lowell, both injury-prone and aging veterans, are going to improve during the rest of the year? The Red Sox don’t just need a bat. They need a BIG bat. They need a superstar who can turn this offense around. They have the money. They have prospects in the farm system who they are willing to part with. Now, it’s just a matter of finding a team ready to trade a superstar and unfortunately for the Sox, there don’t seem to be any of those. Next ›Does Anyone Care About the Tour de France?